Consumer reviews play a crucial part in an e-commerce company's sales because they give potential customers the chance to read what praises or problems their peers had with a product. It's one of the main ways consumers research potential purchases. Other ways consumers research is through emerging solutions like virtual fitting technology, such as fits.me (recently acquired by Rakuten) that capture shoppers' dimensions and fit preferences to help retailers personalize shoppers' experience by even notifying the shopper if the clothing item will be too tight or too loose. This is just another way to make a potential buyer feel confident about their purchase. Another way to ease buyer apprehension is Google's new feature Google Business View, which allows users to virtually see inside a business before they leave their house. It works in the same way as the aforementioned services in that it gives users control over their research process and makes them feel at ease about doing business with a company (see a Chicago-based restaurant's virtual tour in action here). 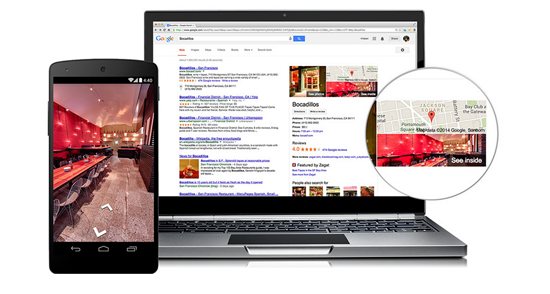 To enable businesses to show users inside their stores/restaurants/etc., Google has partnered with MassInteract (among a long list of other trusted photographers and agencies), a Chicago-based digital marketing agency. By contacting MassInteract, national and local companies can now digitally display their store’s aesthetics by providing perspective customers a personalized 360-degree tour of their business. The way it works is that MassInteract’s Google Certified Photographers use professional fisheye camera lenses to produce high-definition panoramas. The team of expert photographers then stitch the photos together to create a 360-degree visual experience. There is a one-time fee associated with the service ranging from $479 for the silver package to $1,500 for a custom, enterprise package.